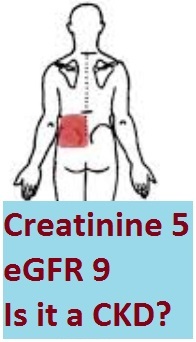 What Does Creatinine 5 and Hemoglobin 7 means? Creatinine is the main waste product used to measure the efficiency of the kidneys, elevated when kidney have a damage or blockage. Haemoglobin is a molecule inside red blood cells which attach oxygen and transport it to tissues. Backpain is not usually a sign of renal impairment unless creatinine is elevated, however kidney diseases are common at such age, here’s simple interpretation of your blood test results. Creatinine normal range is 0.4 – 1.4 mg/dl and therefore Serum creatinine of 5.0 is a high level which mark a severe kidney disease, may be acute or chronic. Blood urea nitrogen normal level is 23 while the results show BUN 140 which is elevated and confirm the kidney disease along with the creatinine results. Haemoglobin 7.5 out of 13 – 17 g/dl means anemia, the anemic person experience shortness of breath and pallor appearance as well as the weakness due to poor oxygenation of the body tissues. Complete blood count show increased white blood cells count of the type neutrophils, neutrophils are those white cells responsible for removing the bacteria and dead tissue from the blood circulation. The medical report suggests progressive chronic disease as the eGFR is below 15, to confirm this diagnosis you must wait 3 months on such high levels along with ACR more than 30. Read more about GFR test. High blood sugar levels caused by diabetes which is the most common. Long term use of nonsteroidal anti-inflammatory drugs (NSAIDs), such as celecoxib and ibuprofen, and certain antibiotics. What to do with creatinine 5? Target blood sugar: 110 mg/dl or lower. Quit Smoking and alcohol as smoking can lead to atherosclerosis, which reduces blood flow to the kidneys and increases blood pressure. Avoid dehydration which can be results from diarrhea and vomiting. Treating CKD require integrated course to treat underlying causes as well, see more about creatinine blood test. Cholesterol 310 Triglyceride 205 Glucose 470, what is the meaning? Is Bleeding Normal After teeth removed? What does high uric acid levels in my blood test results, with pain in feet means?